'Follow-Up' Podcast: Why Is Ottawa So Obsessed With A Daniel Jean 'Cover Up'? The prime minister's India trip is still a hot topic. 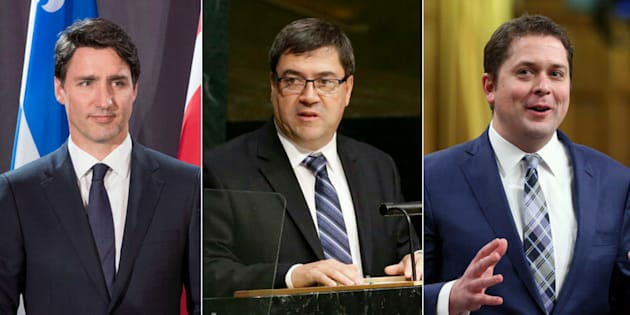 Prime Minister Justin Trudeau's national security adviser Daniel Jean, centre, has been the focus of question period debate for the past two weeks. Conservative Leader Andrew Scheer wants the Liberals to send Jean before a Parliamentary committee. OTTAWA — A month after Prime Minister Justin Trudeau's much-ballyhooed trip to India, the Conservatives can't stop talking about it in the House of Commons. The Tories want Trudeau's national security advisor, Daniel Jean, to appear before a Parliamentary committee so they can question him about a media briefing on Jaspal Atwal's presence at official events during the overseas trip. Jean had blamed the Indian government for inviting Atwal — who was once convicted of trying to kill an Indian politician in B.C. Suspecting the involvement of the Prime Minister's Office, Tories claim there's a "cover-up." In the latest episode of "Follow-Up," our Ottawa bureau chief Althia Raj wades into the Atwal affair and the Jean obsession with iPolitics reporter Kady O'Malley. Take a listen and tell us in the comments who you think is right and wrong.